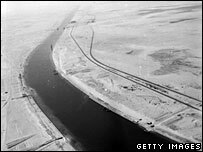 Fifty years ago the Suez Crisis erupted over the Egyptian president's decision to nationalise the Suez Canal. The first of a series of articles marking the anniversary looks at how the conflict spelled the end of the British Empire. 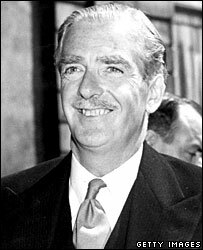 The Times pronounced not only on Anthony Eden's life when he died in 1977 but on the life of Britain when it wrote of him: "He was the last prime minister to believe Britain was a great power and the first to confront a crisis which proved she was not." The conventional verdict on the Suez operation is given by historian Corelli Barnett, who wrote about Suez in his book, The Collapse of British Power. "It was the last thrash of empire," he told me. "A last attempt by a British government to do the old imperial thing in defence of far-off interests. It was a complete folly." It is not easy these days to cast back 50 years to 1956. Britain still had an empire. Memories of World War II were fresh and English schoolboys were taught that Britain (England more like) had won the war. There was some understanding that the Americans had come in, but at a late stage and almost no mention of the Soviet Union at all. We were told: "British is best." Underneath, though, all was not well. Although Britain kept naval ships east of Suez, the end of Empire was at hand. Some places it knew would go - Ghana (the Gold Coast), Nigeria. Some had already gone, India mainly. Elsewhere (in Kenya, Cyprus, Malaya) it was battling to put down revolts and uprisings. In Cyprus, a British minister announced that the island could "never" be independent. And at home, while prosperity was growing, Britain was still much weakened after the war. Yet it still had pretensions to sit at the top international table. It had just taken part in the Korean War, though its reduced role should have rung alarm bells about its real power. Eden himself rejected the idea that it should join the then young and continental "Common Market". He declared grandly: "Our horizons are wider." He was looking back to an age that had been and not to the age to come. Eden had been brought up politically in the 1930s. He was against appeasement and was particularly hostile to Mussolini. In 1938, he resigned as Neville Chamberlain's foreign secretary when Chamberlain wanted to open negotiations with Italy. Herein lay the origin of the Suez crisis. 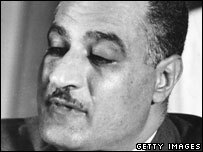 When in 1954 a new type of political leader, Gamal Abdel Nasser, a strong Arab nationalist, emerged as leader of Egypt, Eden did not understand that the world had changed. Instead he looked and saw another dictator, another Mussolini. 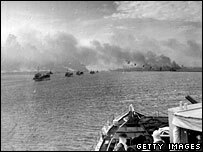 Eden could not accept that Egypt should run the Suez Canal, even though he had previously accepted that British troops should leave the Canal Zone. The canal had lost some of its strategic importance for Britain, but not all. And it had acquired a new importance, as a passageway for oil to get to Europe. When, therefore, Nasser announced that he was nationalising the Suez Canal Company (partly, he said, to pay for the Aswan dam that the West refused to finance) in which Britain and France had controlling interests, Eden was alarmed. He told his government colleagues that he would not allow Nasser to "have his thumb on our windpipe". And so Eden concocted a secret tripartite plot with France and Israel. France was hostile to Nasser because Egypt was helping the Algerian rebels, and attached to the canal for historical reasons. After all, a Frenchman built it. Israel was longing to have a go at Nasser anyway because of Palestinian fedayeen attacks and the Egyptian blockade of the Straits of Tiran. The ruse was that Israel would invade Egypt across the Sinai peninsula. Britain and France would then give an ultimatum to the parties to stop fighting or they would intervene to 'protect' the canal. And so it played out. The Israelis even had to moderate their attack in case they won before the 'intervention' forces could arrive. But the British and French went in to 'save' the canal. There was only one thing wrong. Eden had not told the Americans. And President Dwight Eisenhower, concerned about wider relations with the Arab world and horrified at such an adventure anyway, was not amused. "Our closest ally pulled the plug," says Corelli Barnett. "We acted on the back of a struggling economy and there was a run on the pound. "Macmillan, who was Chancellor of the Exchequer, told the cabinet that the only way to save the situation was for an IMF loan backed by the United States. "The Americans refused to back it. We were told by them to go no further and to evacuate promptly. So we did. It was a complete fiasco." British and French troops left Egypt by December 1956. Eden left office early the next year. For a start, it got the Soviet Union off the hook, as it was brutally crushing the Hungarian uprising at the same time. But it also meant that no longer could Britain - or France - act alone on the world stage. They did however draw different conclusions. 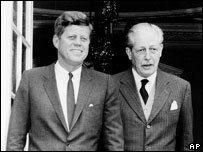 Harold Macmillan, who succeeded Eden, decided that in future Britain had to side with America. He made good friends with President John F Kennedy and even persuaded Kennedy to let Britain have the Polaris nuclear missile. Since then, Britain has been reluctant to oppose any US policy. Even during Vietnam, the Labour Prime Minister Harold Wilson forbade criticism of the US while shrewdly refusing Lyndon Johnson's request to send a token force. France on the other hand went its own way, led in due course by de Gaulle. It left the military command structure of Nato and turned to leading Europe alongside a newly prosperous Germany. Just as Britain always thereafter tended to side with the US, so France tended to oppose it. Modern revisionist theories hold that the mistake was really made by President Eisenhower, in that he showed a weakness that the Soviet Union exploited. Whatever one's views of that, there is no doubt that Suez represented the end of a long phase of British imperial history. Eden : "We make no apology and will never make one"